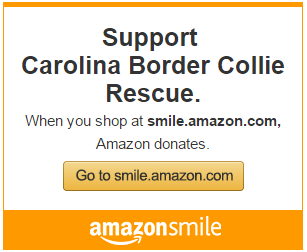 Please consider a tax deductible donation to Carolina Border Collie Rescue! Our foster homes pay for food, transportation, the occasional home repair, and other incidentals involved in caring for their furry guests. We have the help of several generous veterinarians, but, it is rare that the adoption donation covers the cost of medical care, shelter fees, and other expenses. Your donation will go directly towards these expenses. Our rescue group would not exist without donations. CBCR is a recognized 501(c) (3) public charity. If you have any questions, please contact wimzical@gmail.com.